The wave of prog rock / metal bands from Poland is still rolling and now Electrum Productions releases Acute Mind's self-titled album out side their home country. In Poland the album was released in February 2010. The band was founded in 2006, but had to face line-up changes. In 2008 they were asked to open up for Quidam, the show encouraged them to go on. In 2009 the last line-up changed happened and singer Marek Majewski joined the band. They signed a contract with Electrum Production, a young label based in their home town Lublin. Thunder, a siren and the sound of a helicopter lead you into the opener Grief And Pain. At the opener Acute Mind combine progressive metal with modern metal elements. Partly the melodic vocal line reminds me of some British prog rockers... Garden is following, a melange of prog rock, metallic riffs and spoken word passages. Dorota Turkiewicz's keyboard and Marek Majewski's vocals slowly lead you into the moody Misery. The band joins in, but they don't change the atmosphere. Here is the video, it's the easiest way to check out Misery! Quite heavy starts Bad Incitements, but they swing between heavy, riff-based parts and more melody passages. Here the Polish remind me a bit of Threshold when Andre McDermott was their singer... Bonds Of Fear is a riff-based prog metal tune, but also offers melodic passages which invite you to get lost into reverie. They close this chapter with Prophecy, a tune which is a bit more complex but still offers a catchy hook. 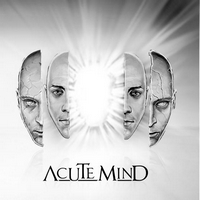 Acute Mind cross the borders between progressive rock and prog metal - sometimes in one song. Fans of Threshold and Arena should check them out as well as lovers of Symphony X and Dream Theater.